Open source WindowBlinds and SkinStudio and put them on GitHub. Never let software die!!! You can still sell Object Desktop. There is enough in there for a $20 subscription. And Wincustomize subscriptions. If WB and SKS are sold I think they will quickly join Impulse and never be seen again. The main problem with skinning today is less interest and being so difficult that only a few people can make skins. A "light" product that just changes a few colors could gain more traction. I stopped using WB (but kept my OD subscription), because I felt WB was "too much" and not being fully compatible (I'm not sure how HiDPI works with WB for example). Skinning as art exploring new technical boundaries - that era is probably over - what can be done with current tech has already been done (personal opinion). This is a terrific discussion. A few thoughts and responses in no particular order. Screen time today is dominated by mobile devices. Thus, people aren't having to stare at ugly computers nearly as much as they used to. At the same time, Windows has gotten incredibly locked down and the perceived value of software, in general, has been greatly reduced. Another challenge we face is finding programming talent. OS customization requires low level understanding of how the operating system works. When we look at WindowBlinds 11 (or whatever it will be called) the issues we deal with now are things like high DPI, backwards compatibility, third party apps using their own skinning, ease of skinning and ease of maintaining it. And some of those goals conflict. What part of a WindowBlinds skin matters the most to you? That would help us focus our development effort. Our big project focus is on DeskScapes 10. We also want to create a successor to ObjectDock that would become part of Object Desktop itself. Another area is audio. The audio situation on Windows is terrible. It's still Windows NT era tech and that's something we think we can improve. DesktopX was very near to my heart but Windows is just too locked down now to bring it back. Apps like Groupy, Fences, Launchers, virtual desktops, Start10, and others that add functionality to Windows are in a better place imo than the others. The support situation on Windows has been a challenge. I think going forward, we will probably have to move to a subscription model because a large % of our support budget, which comes right out of the development budget too, comes from customers who bought a $5 program 2 years ago and need support. We want to give them great support but we can't afford to give support for $5 one time purchases. Under the covers, WinCustomize keeps getting upgrades. But bandwidth wise, it's a tough thing as you get into a chicken or egg thing. With most of the other skinning sites gone, pretty much everyone comes here but few buy subscriptions. Subscriptions determine the bandwidth we pay for. Mainly, what we need to do is take a top to bottom look at at the business model and make some changes so that people who are passionate about this can keep getting cool stuff while it still being a viable business model. The first 2 are important, the 3rd less so. I like it when 3rd party programs are skinned, but if they can't be or can't be skinned properly, I just exclude them and move on. Yes, it 'd be nice to have an all over uniformed desktop, but I accept that some things can't or won't be skinned properly and am grateful mostly everything else can be. As for the something else? Would it be possible to cycle wallpapers in the WB directory? That really would be a huge enhancement if possible.... being able to cycle wallpapers at defined times: every hour; 20 or 30 minutes, etc. Another thing I'd dearly love, and others have expressed an interest, too, is to be able to add desktop shortcuts to Iconpackager and save them. 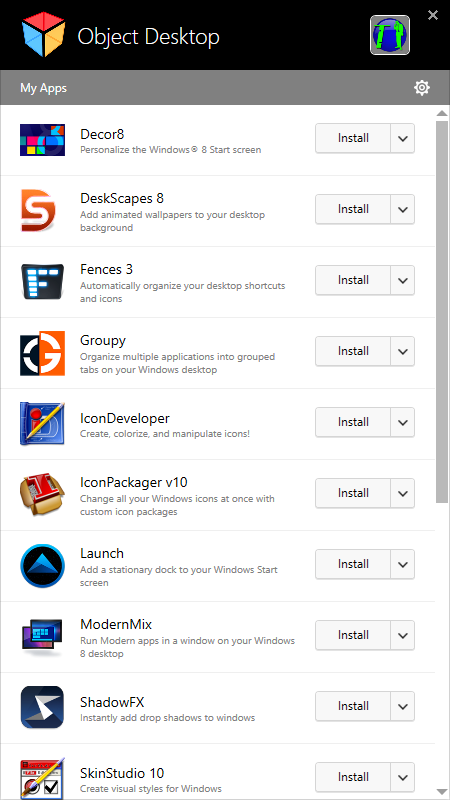 Many packages include icons for IE; Firefox; WMP, and MS Office apps, and include icons that could substitute for other apps, and if we could include the desktop icons for those apps it would be far less tedious than having to manually apply them every time. Regarding Windowsblinds, I agree with what Starker's says is important insofar as the top two being the highest priority. I too realize that once another program launches, they are pretty well in charge of how it looks, at least being able to frame it and have the overall feeling that you have control and like the appearance of the first two things mentioned goes a very long way. When you're just in the realm of opening up Explorer and are copying a file, it's really nice to have a design and color scheme that reflects what you want and makes you happy. That sort of environment is what I would hope could be maintained in Windowsblinds. We wrong if we expect people at Stardock to be miracle workers beyond what is practically doable. I think if we could have that maintained and have new aspects within Object Desktop or other programs, that would be great. That is my opinion, and I really appreciate the opportunity to be listened to regardless of the eventual outcome. Kind of feel like I'm tip-toeing through a minefield. Window frames and buttons, taskbar and its buttons and preview background. Fonts and colors, at least to some degree. Very fond of the current abilities to hide the explorer ribbon, control blur and transparency, and do broad color adjustments. I'm not getting into which number is needed or not. For me skin as much as possible for the Window versions 7/10 a most people are using. I have watched post after post about 3rd party apps not skinning correctly. Firefox and so many more. Stardock must have spent months and big dollars over the years trying to keep up with it. I don't care about Opera, Chrome, Microsoft Office being skinned or again any 3rd party applications being skinned. This alone should save a lot of time and money only having to skin a couple Microsoft windows version and lower cost greatly. I consider myself to be a very active member here. I truly enjoy helping people on the forums especially with people that what to change something in a WB and need SKS help. I also continue to upload WB skins. I agree SKS could use improvements. On the other side it is very hard to learn but can be done. There are other people here that will help. If someone really wants to learn it learning can be achieved. There may be only a few of us left but WB's at a good pace are still being uploaded and free ones included. Those of us still making them all have a passion with skinning. Last. To let WindowBlind go, NO not the answer. I understand the investment takes money. So before it comes time to pull the plug on it just spend resources to keep it working on Microsoft Window. Really you only have to keep it going on Win10. As long as you don't remove any code and only add changes for win10 it will continue to work fine on previous versions. This should greatly reduce any cost of keeping it going. After all I'm an old guy and making this stuff really helps me pass time. So hell, keep it going for the seniors. ( Lightstar isn't any spring chicken either but loves to skin.) There is me, Lightstar, Don, Neone6, adni18, gmc, IceBabee, and sorry if I missed anyone as I only looked at 2019. There are free and paid skins, but the free ones are great quality. 26 skins in just 7 weeks is plenty for the amount of people skinning. It is alive. Thank you. Our big project focus is on DeskScapes 10. I know nothing of business. I truly am a redneck. That said, WTF? An animated wallpaper takes precedence over skinning the whole GUI? How messed up is that? For me, it's all or nothing. I don't want a half skinned GUI. I realize that some of it is unskinnable now, but not much. I see very few parts not skinned. Any chance getting back something "like" RightClick? I know I'm not the only one who would love that. The entire UI is important to me. If you are going to do something, do it right the first time or don't bother doing it at all. I have lived by that philosophy my entire life. Also, what the heck is "Client area skinning?" What I'd like to see is to bring back the programs for 98 and XP. I have noticed in the past years that Retro gaming is making it's way back. Old 98 and XP machines are being refurbished, I for one just restored an old Dell XP tower. It would be nice to be able to download the Stardock programs for those OS's. If you look at it another way, there are hundreds of WB, IP skins for 95, 98 and XP that are just sitting in their galleries not being used taking up valuable server space. So why not have the option to download the programs for these. You could sell it as a package: XP package or 98 package and explain that these programs worked on that current OS at that time and no changes or support will be offered. Only https://forums.wincustomize.com will let me. Logged in on both sites. Then the answer, unfortunately, might be nothing. Every app these days seems to want to do their own thing and Windows itself is becoming more and more difficult to do things with. At the same time, the number of users interested in skinning the UI is decreasing and those that are interested are generally unwilling to pay what it costs to develop it to that level. If the answer is "some" then that's a different situation. I’ll vote “some” as well. Some please, or my last subscription to Object Desktop will be my last. 3rd party apps are irrelevant, WB only needs to worry about skinning the OS to be the best possible, to heck with those apps. But I guess if WB and SKS go away, we have no choice. You will lose a heck of a lot of business though, and your roughly 43% of sales taken by Stardock from Master Skin sales will be completely gone. All WB designers will leave, as well as a large percentage of users and subscribers to the site. To all those whom I've helped financially from my sales over the years, I apologize in advance if this does happen, I am truly sorry, but it is not my choice. Then I explained how long it takes, all the little fiddly bit that go into making a skin. Reminded ‘accountant’ how long it took me to do the few skins I did, and wouldn’t it be nice if I could make a few bucks for doing that? i have no problem buying a really good skin that matches my taste. Yeah, now I really wish TGTSoft and Stylebuilder were still around. At the same time, the number of users interested in skinning the UI is decreasing and those that are interested are generally unwilling to pay what it costs to develop it to that next level. Nobody asked me, if I was interested in paying more, to get WB to the next level. With those parts skinned it makes sense to get a WindowBlinds skin installed on your pc. These three needs to be skinned for a feeling of having a completely skinned OS. People still BUY a lot of Master skins ! Therefore I think WindowBlinds should be kept maintained. Surely there is a way to make it a profitable business for everyone involved.